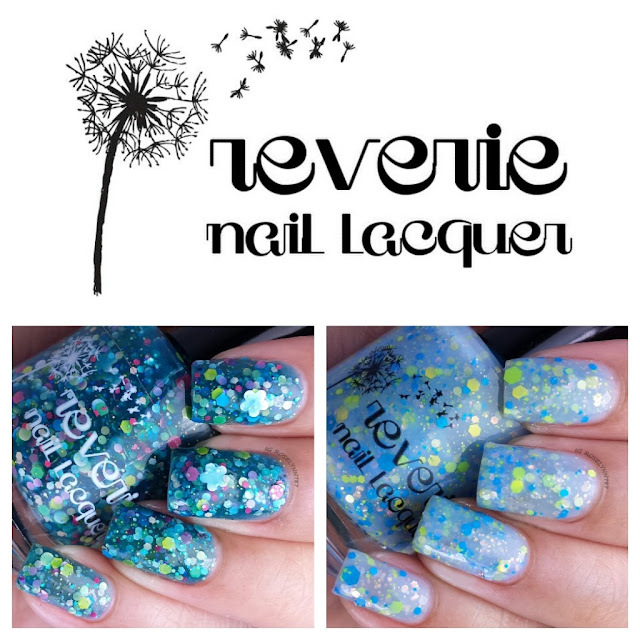 Both of these polishes by Reverie Nail Lacquer are part of her Fall release and are now available for pre-order. Pre-Order starts today and ends on September 14th. These polishes are both available in full and mini sizes. 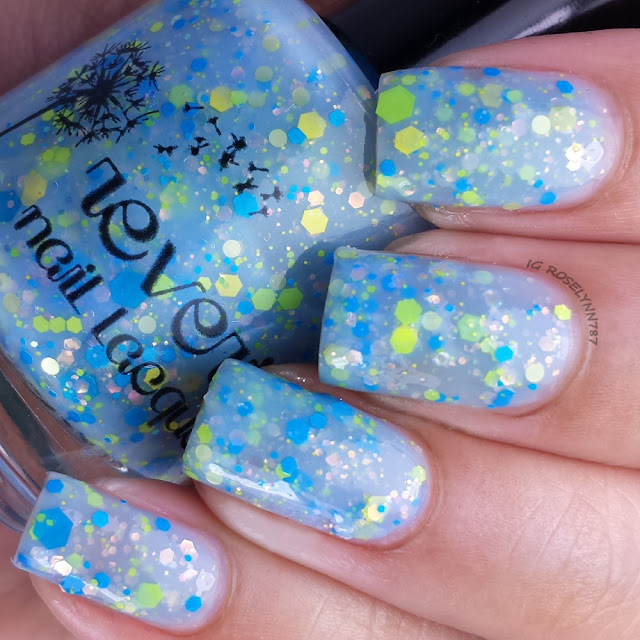 Lagoon is a squishy teal jelly polish loaded with a rainbow of circle and hex glitters and large white flowers. Do I even need to say anything? This polish clear can speak for itself, it's so gorgeous. 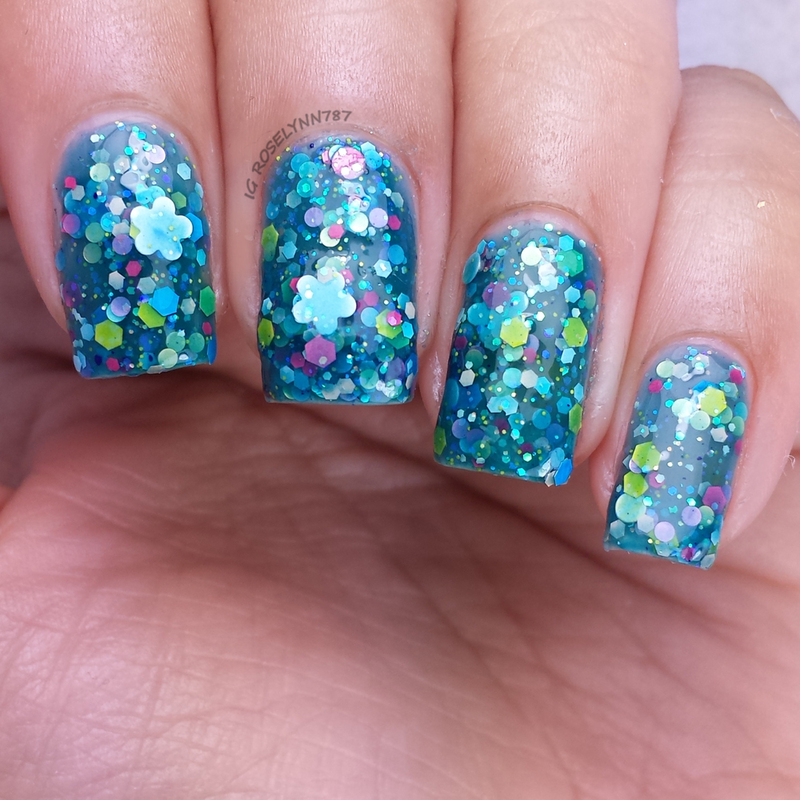 The glitter combination is nothing short of intense, colorful, and full of life. 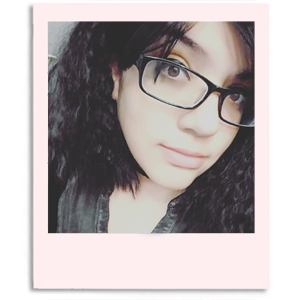 I love it and I'm still wearing it a few days after this swatch. Formula and consistency are pretty good, there was also no need to fish for any glitters. Even for the large flower glitters, I didn't have a problem finding them in each brush stroke. Because this polish is so glitter heavy, you'll have to make sure to apply it with a dabbling motion. I used three coats whilst dabbing and sealed it with a topcoat. Dog Days features a pale blue base loaded with bright yellow and blue glitters and orange iridescence. The bright green glitters are a perfect touch for the pale base. This is going to look great for spring next year as well. Formula was almost identical to Lagoon, it applied really easily using the dabbing method. The glitters required no fishing whatsoever. 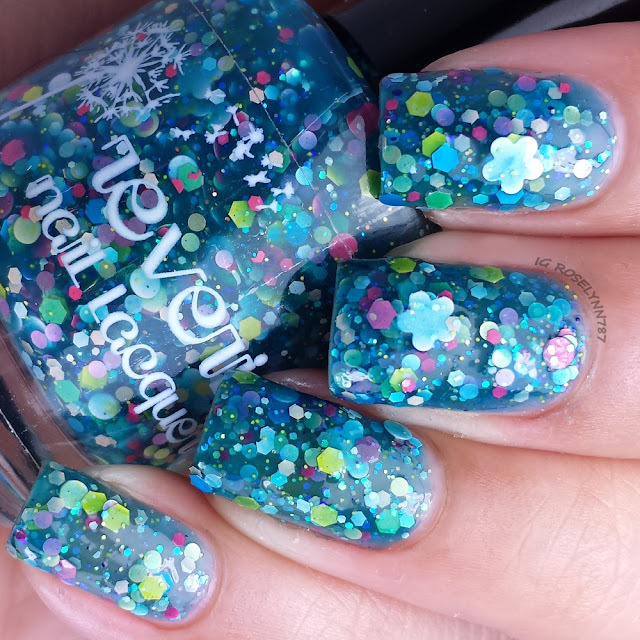 It's so glitter heavy that you'll need to seal it with a top coat. Another special surprise in my swatcher package was Reverie Nail Lacquer's cuticle balm. I regularly use various cuticle oils and have only been using this particular one for a week. With that in mind, these are just some quick overall thoughts rather than a thorough review on product functionality. After a few weeks of use, I'll update you guys on my results and any improvements I may notice. 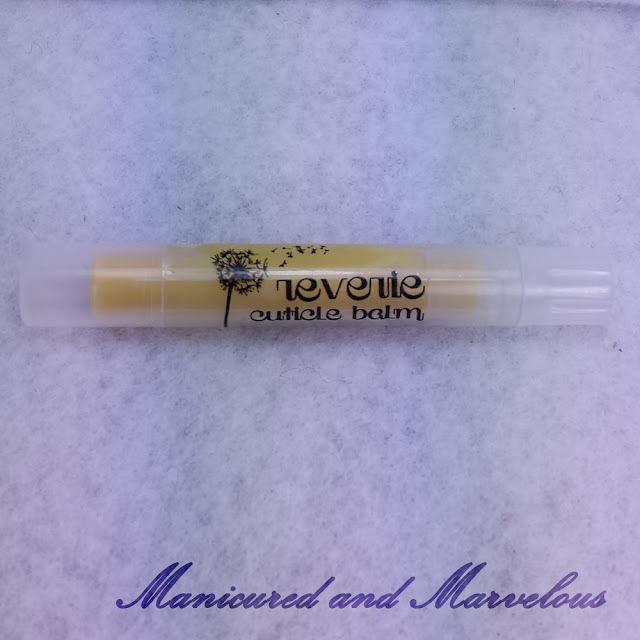 Reverie Nail Lacquer has over a dozen scents available for their cuticle balm, however, it also comes unscented. While I love the smell of my Cinnamon Bun balm, the scent is very potent. I happen to really enjoy it because it masks the scent of constant acetone, but it's definitely personal preference. I love the tube as opposed to having a bottle, very easy to carry around in my purse. It's also very absorpt and doesn't leave my cuticles feeling sticky or oily. Overall I'm impressed by this indie and the fantastic formula for glitters. Some are not a fan of the dabbing method for applying polishes, but these polishes definitely require it. The color and glitter choices are very stunning, however, I have to say I'm not sure if I like them for Fall. Both of these look much more suiting for the Spring. Either way, I'm loving these - I definitely recommend Lagoon, it's a must-have. Be sure to follow Reverie Nail Lacquer and don't miss out on new releases, stock information, and sales.